Former factory workers Pleasure Molaudzi and Nomsa Mlangeni are at last following their true interest – running a piggery. Despite hardships, they are determined to succeed. Peter Mashala reports. A love for farming, hard work, and a resolve never to give up. These have laid the foundations of success for Pleasure Molaudzi and Nomsa Mlangeni, and their story shows what can be achieved when one is determined to overcome all obstacles. Pleasure, 40, and Nomsa, 47, were laid off from Lear Corporation SA, a manufacturer of automotive components in Rosslyn, in 2005. Interested in going into business, they became involved in a brickmaking co-operative. It didn’t take long, however, before they realised they were following the wrong path. “I joined the co-operative because I was scared of being unemployed, but I became pretty bored with bricks,” recalls Pleasure, who hails from Letlhabile, 20km north of Brits. Nomsa, from Mamelodi east of Pretoria agrees. “We both had a love for business, but not bricks!” she says. Instead, the two friends shared a passion for farming. “While we were still busy with the brick business, I did research on farming,” recalls Pleasure. “And we decided we wanted to start a piggery.” Initially, their idea was to launch a farming division within the co-operative. Pleasure and Nomsa met while employed by Lear Corporation in Rosslyn. They were both laid off in 2005 and now farm together. “We found a complete piggery farm with good infrastructure near Mooinooi which was for sale,” recalls Nomsa. They approached Land Bank for a loan to purchase the farm, but without success, as they could not convince the bank that they had enough experience. “Another problem was that I had been blacklisted since retrenchment – I owed a clothing retailer about R1 000,” Nomsa explains. At this stage, it was obvious that the other members of the co-operative were not interested in farming. Determined to succeed, Pleasure convinced Nomsa that they had to forge ahead on their own. So they spent the next five years saving and planning, and finally in 2010 used their savings to buy seven sows from a pig farmer in Maboloka village, near Letlahbile. They then rented space on a small piggery in Mamogaleskraal near Brits. However, the arrangement did not last long. “We lost three pigs to theft, but our landlord could give us no explanation,” remembers Pleasure. Unable to find a suitable alternative, they housed the pigs in Pleasure’s backyard at home in Letlhabile. The move did not go down well with his neighbours, who complained to the local health department. Fortunately, the Madibeng Municipality came to their aid. 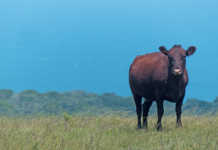 Johanna Motswatswi, head of the municipality’s agricultural division, helped the pair secure an 8,5ha plot, complete with old piggery infrastructure, in Oskraal. The property belonged to a local optometrist, who allowed them to occupy it rent-free as it was vacant and vulnerable to theft. Pleasure and Nomsa were required only to pay for electricity and maintain the property in good order. The arrangement suited them well. They signed a 10-year lease agreement, moved in at the beginning of 2011, and got to work renovating the old piggery structures. They soon experienced disappointment, however. Their sows, which had been pregnant at the time of the move, farrowed, and almost every piglet, as well as several sows, died. The Motsumi veterinary clinic in Brits performed autopsies, identified the cause as tapeworm, and advised Pleasure and Nomsa to use Dectomax injectable solution. “The experience taught us the importance of a clean environment for our pigs,” says Pleasure. “We moved the animals out of the piggery temporarily and this time cleaned and sterilised the place thoroughly. Like many people, we made the mistake of thinking that pigs love dirty places.” They also began deworming their pigs as instructed by the vet . The Old Mutual Masisizane Fund financed Pleasure and Nomsa’s new piggery, which has space for 28 to 30 sows. R198 for a 50kg bag of feed,” says Nomsa. “A pig eats at least 2kg a day, which means that each pig consumes 1¼ bags of feed a month. But it’s what you have to do to get decent growth rates, good health and respectable profits.” She adds that the pregnant sows’ feed ration is increased from 2kg to between 3kg and 4kg a day after farrowing to make sure it stays strong and produces enough milk for the piglets. The piglets are given an iron injection between three to six days after birth to improve their immune system. Iodine is then applied to their bodies, especially the hooves and umbilical cord, to minimise the chance of infection. At about 27 days, they are injected with vitamin B12 and Norotrim, an anti-bacterial medication, and introduced to weaner rations. “The medication helps the piglets to digest the feed more easily, otherwise the piglets might get diarrhoea, which can be fatal,” explains Pleasure. The piglets are put on 0,4g of weaner ration in the first two weeks, followed by 800g. 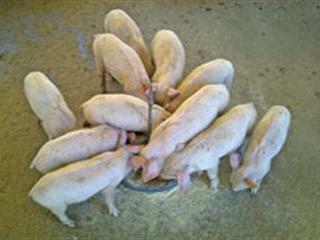 The rations increase steadily thereafter until the pigs reach the baconer stage – between 80kg and 100kg. 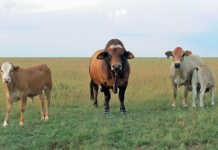 Pleasure and Nomsa began by marketing their baconers to the Brits abattoir, but due to lack of infrastructure and capital, were able to sell very few. It was clear that they needed a loan to expand their operation, but having been turned down already by Land Bank, they did not know whom to turn to. Once more, Johanna Motswatswi of the Madibeng Municipality helped them out, introducing them to the Old Mutual Masisizane Fund. Unfortunately, though, a sound business plan was not enough to secure the loan. Lack of infrastructure is one of the challenges faced by Pleasure and Nomsa. There are as yet no proper feeding troughs, which increases feed wastage. “We needed to convince them we could repay the loan,” recalls Pleasure. “Then Frederick Coetzee of the Brits abattoir came to our rescue, by offering us an off-take agreement. Thanks to this, we managed to secure the loan.” The money enabled them to build a new piggery structure with a capacity of 28 to 30 breeding sows, as well as buy a certain amount of feed for the pigs. “The fund came at the right time as we were struggling with feed,” admits Nomsa. The off-take agreement is to supply the abattoir with 100 baconers weekly. In addition, they have a verbal agreement with two other outlets: the Brits Meat Market and the Brits Pick n Pay. Although they have signed these agreements, Pleasure and Nomsa are still far from being able to service the market. “We need to increase the breeding stock and build another structure,” explains Pleasure.Unfortunately, additional financial assistance is not forthcoming. Nomsa says that they have applied every year for funding from the local department of agriculture through various programmes such as the Comprehensive Agricultural Support Programme (CASP), but have never been successful. “They arrange workshops and seminars, but that’s all,” says Pleasure. “And this is an area with desperate unemployment. If we can increase production, we’ll also be able to create some jobs in the community.” Despite these challenges, the pair are determined not to give up. “We’ll continue working hard to make sure we reach our goal of becoming commercial,” says Nomsa. Contact Pleasure Molaudzi on 072 781 0225.